I was probably a little cocky. I wasn't worried about this half-marathon because I had gone ten miles before and wasn't too worried about my time. I just wanted to finish. There was a point, around mile 10, where I had my doubts. If that guy would have traded his bicycle for my half a peanut butter sandwich, I would have been gone. My knees hurt, my leg muscles were tight as hell, and I needed something I wasn't getting from the pavement. I started to get passed about mile 10 by marathoners. You would not ever mistake me for one of them as they are scantily clad, they run with a fierce and focused look, and they have an amazing form. Ah, well. I don't do too badly for an old gal. It was an amazing experience. I lined up with almost 2000 other folks, we ran down the streets and onto the country roads together. I talked to hundreds of volunteers who passed out water, offered encouragement, and in the end, asked if I was alright. As much as I hurt in the end, I wanted to run in and I did. As I came around the corner by the Pub 500, I ran. 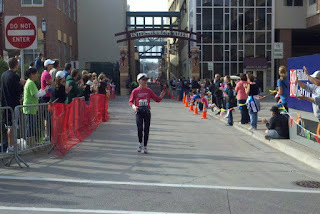 I ran down the alley and to the finish line. I am not ashamed to say I wept. The crowd cheered. The announcer said my name. I was wobbly and my legs hurt. I needed water. Regis was right there to take my picture. What an amazing experience. I'll say this: I enjoyed it. I talked to many people along the way. I thanked as many volunteers as I could. I saw a couple sitting in front of their bonfire on a hill and waved to them. I enjoyed the Red Jacket Trail through the woods. Regis said maybe I was like Opus the Penguin, running down the street throwing flowers over his shoulder. Yes, I think I was like that. What a day. When you come to Canby I will send you to Porter and back for something to do while you are waiting for your birthday cake. You did great. I cannot imagine even thinking about running 13 miles. Great job, Teresa! Isn't it a great feeling to cross that finish line? I heard it was a great event - I think we'll have to try it next year!